I recently registered for one of the new online courses offered by Coursera – Introduction to Mathematical Thinking. Though the class has not yet started, the instructor has posted a few videos that introduce the team working on the course and discuss the core issues that the course will deal with. I took some sketchnotes while watching the ‘Meet the Team’ video to capture some of the conversation – check out the image above to see the result. I’m interested in this course for a variety of reasons. First and foremost – I am a high school math teacher. Coincidentally, this course runs precisely during a stretch of time in which I will be completing a long-term substitute teaching gig for a Geometry and Algebra 2 teacher. It will be my closest brush with full-time teaching, and I think that this mathematical thinking course will complement the substitute teaching experience well. One of the reasons that I choose to continue substitute teaching (as opposed to looking for a permanent position) is because there are too many things that I am trying to figure out about myself, life in general, and teaching in particular to dive into a permanent position that I know will consume me more than I would like. So this course might help me figure some things out about how to teach math. If nothing else, it will deepen my knowledge of the discipline, which will make me better able to teach it to others. This course is described as a bridge between high school mathematics and college mathematics. It seems that high school mathematics is viewed in a narrow light, and I think is it important to keep in mind that there is no reason we should not encourage sophisticated mathematical thinking in the pre-college years. My hope is that by taking this course I will be better prepared to bring the ideas presented here into my high school classroom. I’m also interested in this course for purely personal reasons. As an undergraduate I studied physics, and even went on to a graduate program with the idea of getting a Ph.D. After one year of that program, however, I was worn out and not satisfied enough to keep at it for the additional six years it would take to finish. I think that one of my shortcomings was in the area of mathematics – my background just wasn’t strong enough. Lately I’ve had a desire to learn both physics and math again from the ground up. This course might help me do that. 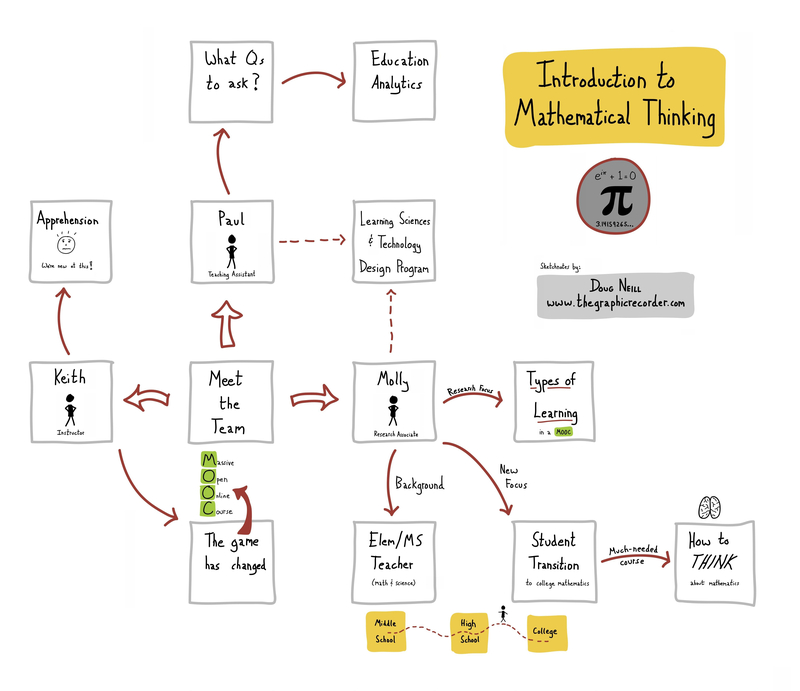 If you want to see some sketchnotes I took for another coursera course – check out the Model Thinking category. Though I only made it through the first few videos, it was still a worthwhile experience that I hope to build on with this course.